Morgan and I ventured down South this weekend for a little needed sunshine! On Saturday, we drove down to Irvine for our friend's birthday BBQ/tournament. After being sorted onto different colored teams, we competed in several games like ultimate frisbee, balloon toss, freeze tag, and charades. The next day, we went to Disneyland to ride the highly anticipated Little Mermaid ride that just opened up in California Adventure. I couldn't help feeling giddy knowing that my favorite Disney movie growing up had FINALLY been transformed into a ride! 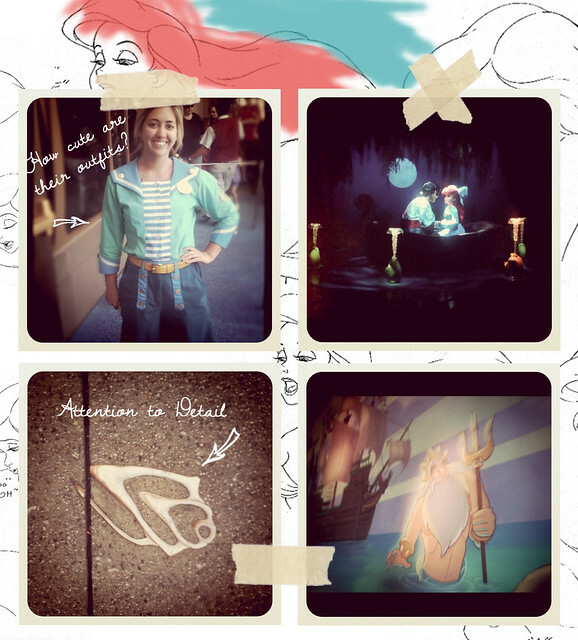 I loved shell inlay in the concrete, the cast members outfits, and the fact that they called us "little sailors." One Mickey ice cream, a slight sunburn and two hours later, we finally boarded. You can veiw the entire ride here. I was blown away by the highly developed animatronics (especially Ursula). However, I think I have been forever spoiled by the Finding Nemo ride in Orlando. There, you board a similar clam shell, follow Nemo on his adventure, and then ride through an actual aquarium! After the ride, you can walk around the aquarium and visit the different tanks containing sharks, dolphins and manatees. We are planning on re-newing our passes in a couple months so I'm sure we'll be riding it again and again. Yay! I can't wait to ride this.. Thanks for the review, Christina. It's pretty awesome! If you plan on riding it soon, bring sunscreen bc a good portion of the line is not covered! oh my gosh. i just died!!!!!!!!! !